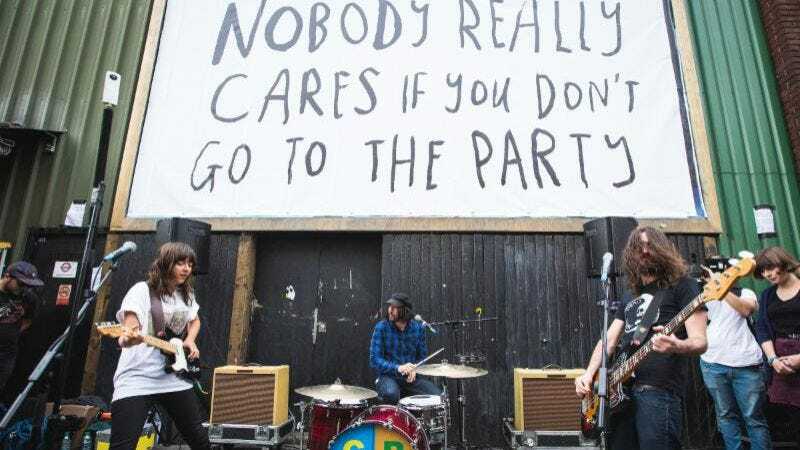 Australian songwriter Courtney Barnett—who we’ve hung out with a couple times, not to name-drop—has been on a viral marketing rampage recently, putting up posters and billboards all over the world with the same uplifting message: “Nobody really cares if you don’t go to the party.” Now we finally now what she was virally marketing, and as you might expect, it’s a video for her song “Nobody Really Cares If You Don’t Go To The Party.” The way Barnett and her band filmed the video is a little more interesting, though: With the help of director Jon White, they all showed up at Camden Town Station in London unannounced and proceeded to jam out in front of a bunch of presumably befuddled British people who were just trying to take the tube to the lorry or whatever. Also, they filmed the whole thing, and you can see that video below. Barnett’s debut album, Sometimes I Sit And Think, And Sometimes I Just Sit is available now.